Below is a pictorial presentation of about a hundred plants we just acquired this past Friday, 15 July,2016 from a private collection of an individual moving out of state. His collection was in Ocean Beach, CA. 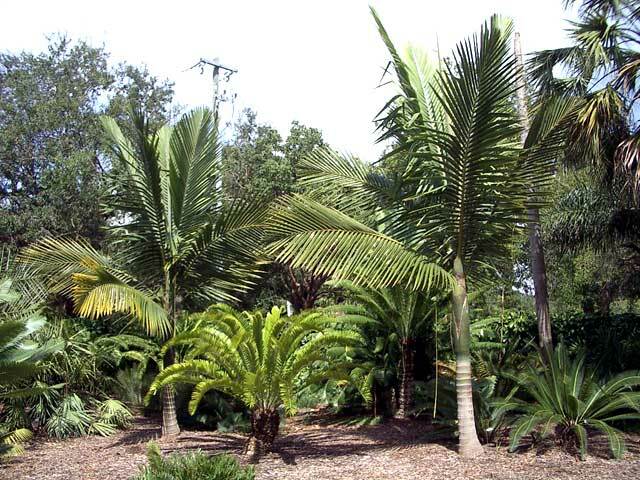 Included are unusual palm species as well as tropical and exotic companion plants. All were grown outdoors and 99% were in containers. All are for sale for ten days from this posting at attractive prices. Many you'll never see for sale. MANY "ONE OF A KIND" ITEMS - NOWHERE AVAILABLE! But, a bit more cold hardy! Cold hardy to mid-twenties F.
Cold tolerance about 25 degrees F.
Another super rare companion plant! Only offered a few in 40 years! When mature, leaf size five feet! Upright stems to eight feet! This plant has sold. May have second plant available later. Like someone cut with scissors! About two weeks ago we got in palms and tropical plants from a private collection in Ocean Beach, CA. We couldn't get it all in one day. So, we returned 2 days ago and got the rest. This gives us the opportunity to show some more plants, many very interesting. These plants are presented in random order. Remember, these are individual plants from the collection and we have no backups on most. As these arrived late, some may have been sold over time and no marked as "sold" in this posting. This single trunk pinnate palm is native to New Caledonia and gets to a height of about 35 feet. It is crown shafted and tends to hold upright leaves. The leaf stems are speckled with dark spots. Growth rate is medium. It can take full sun in most coastal areas. Container size is a 30g clay pot. This unusual Anthurium is in a 5g pot. I've not seen one like this before. In a way it resembles the Birdsnest Anthurium, A. hookeri. But, there are definite differences. First, as the leaves age they get almost black in color. Hookeri doesn't do this. The leaves are also shorter. Finally, it doesn't seem to be forming a trunk like hookeri would at this stage. I'd recommend filtered light for this species. I'd anticipate it'll never be over four feet tall. Rhapis dig quite easily and usual suffer little setback. This 35 gallon specimen was recently dug. It appears to be a hybrid with multifida blood in it. I say this because of the more narrow leaflets, some leaflets coming almost to a point and because of the wider central leaflet compared to the others. These are all characteristics of Rhapis multifida. Also, leaves are carrying nine to eleven leaflets, unlike Rhapis excelsa and the canes are super narrow. If I were to guess, I think it's a cross between multifida and excelsa. It's quite attractive. This plant wants filtered light and should not get much tall. Rather, it will put out more canes. Very frequently we have color Ti plants. These are often red or pink. This is a pure green variety or species. I occasionally have green Ti's in stock but this one if different. It's more of a dwarf plant. It has short and very wide paddle like leaves. It's in a 5g pot and is about 30 inches tall. It'll most likely want filtered light. This cute climbing vine has multiple running stems and is in a smaller sized pot. The interesting thing is the variegated leaves - at least two shades of green. This would be the perfect plant to run up a palm or other trunk in filtered light. It would also be very easy to propagate. It is possible that this is still a juvenile plant and isn't showing the anticipated mature foliage. I say this because the photos I reviewed of this species, when mature, have different appearing leaves than what this plant has now. But, they could change over time and age. A. pedatum leaves are very cool. This plant had a label saying Anthurium pedatum. It's in a 3g clay pot that has a broken part. We'll be repotting it. It'll want filtered light. If it's indeed A pedatum, it's unbelievably interesting. As part of the collection we showed two weeks ago, we had a much smaller Anthurium plowmanii. The plant today is the ruffled form of this species and super rare. You'll probably not find it at too many nurseries in the country and certainly not with this age and size. This plant is an estimated 20 years old and fully filling a 15g pot. It's about mature size. It's a filtered light plant. This is yet another super rare and unusual companion plant that you'll likely find nowhere else. Note how the long leaflet segments hang down from the central leaf in a pendulous manner. Color is a light green. This plant has two leaf stems and leaves. It's in a clay pot. I really like this plant. It is very different appearing. I do not think this plant is a climber at all. Of note, as with all other plants shown today, this was outdoor grown in the San Diego area. This totally mature yet unknown species of Anthurium is a real show stopped. Unfortunately the label got lost at some time during the past two decades. It has leaves that are over six feet long with huge, long heart shaped leaves. Leaf color is green. There are two trunks, one larger than the other. It's in a 25g pot. It would want filtered light. This plant is probably too big to mail order. This is a medium height, single trunk, crown shafted palm from New Caledonia. It is very sought after and can be grown by lots of people in this area. I'd estimate it's age at ten years. It's in a big clay pot. Along the coast, I'd give it half day morning sun, a few hours of sun or strong filtered light. 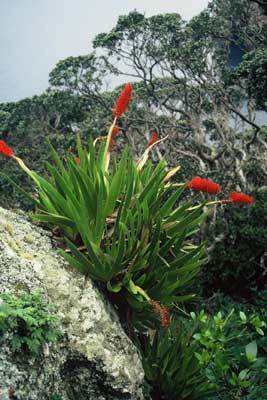 Cold hardiness is into the mid to upper twenties F. Of note, it comes with about six or more flowering Bromeliads at its base. They come with the plant. REMEMBER, WE MAY OFFER DISCOUNTS ON ANY OF THE PLANTS ABOVE!